It stands to reason that Eliot Weinberger, an old Borges hand, should be so adept at teasing out the nightmarish, nearly phantasmagoric dimensions of our country’s post-9/11 situation. Essayist Eliot Weinberger sets his sights on the Bush team with brilliant, thought-provoking, funny consequences. Written for publication in magazines abroad, translated into sixteen languages, and collected here for the first time, Eliot Weinberger’s chronicles of the Bush era range from first-person journalism to political analysis to a kind of documentary prose poetry. 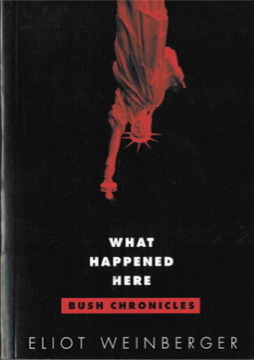 The book begins with the inauguration of George W. Bush in January 2001—and an eerie prediction of the invasion of Iraq—and picks up on September 12, with an account of downtown Manhattan, where Weinberger lives, on the “day after.” With wit and anger, and sometimes startling prescience, What Happened Here takes us through the first term of the “Bush junta”: the deep history of the neoconservative “sleeper cell,” the invention of the War on Terror, the real wars in Afghanistan and Iraq, and the often bizarre behavior of the Republican Party. For twenty-five years, Eliot Weinberger has been taking the essay form into unexplored territory. In What Happened Here, truth proves stranger than poetry.